Breaking news! FBI. Extortion. US Attorney. Sting operation. Movie memorabilia. I cover all the things in today's blog post. 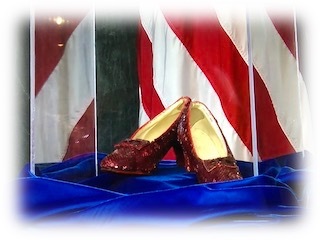 On September 4, 2018 the FBI, the US Attorney from North Dakota, and the Grand Rapids Police Chief held a press conference in Minneapolis to announce that, after thirteen years, Dorothy's Ruby Slippers had been found. The shoes were heisted from the Judy Garland Museum in Grand Rapids, MN on August 28, 2005. Rumors of what happened to the shoes ran rampant over the ensuing years. If you like mystery stories written by Minnesotans about events in Minnesota history, you may be familiar with a little short story called, "Ruby Red Heist," which is part of an awesome anthology published in May 2018 by Twin Cities Chapter of Sisters in Crime. I am the author of said short story! My prep for writing the story included reading massive amounts of information online and in magazine articles about the theft in 2005. Then I took a rad road trip to Grand Rapids and visited the Judy Garland Museum. I walked the museum and through the house where Judy Garland (Frances "Baby" Gumm) lived for the first four years of her life, which is now attached to the museum. After the tour I chatted with a current museum employee, who wasn't an employee back in 2005, but…heck! Everyone from Grand Rapids knew the story! She told me that some folks in town thought it was teenagers pulling a prank or fulfilling a dare from peers. A straightforward burglary didn't seem to fit the bill because there had been a clear plastic box filled with cash donations front and center and that wasn't touched. In fact, nothing else in the museum had been disturbed other than the broken back door and the shattered glass case where the shoes had been ensconced. The only clues left behind by the culprit(s) were glass shards from the broken window, the protective case, and one lone ruby red sequin from a shoe. I stood in the spot where the pedestal had sat back in 2005. I examined the back door. The distance from the door to the pedestal that had held the shoes had not been more than a dozen or so steps. In the following days, weeks, months, and years many leads turned into dead ends. Divers searched the bottom of the old pit mine turned lake, but that endeavor was a bust. Zilch. The heist was the biggest mystery to hit Grand Rapids, MN and was a huge blow to the museum. But now…thirteen years later the slippers are once again safe and sound. Due diligence and perseverance (and some luck?) have paid off and law enforcement took possession of the sparkly red footwear. While several family members and friends contacted me on Tuesday to ask if my story helped solve the crime, I had to chuckle and (reluctantly) say, "no." Would that my little story had helped crack the case…Alas, it is not so. Although, should the FBI wish to speak with me, I'd be quite willing! Not familiar with the short story, you say? 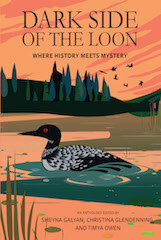 Please, buy the book, Dark Side of the Loon: Where History Meets Mystery. The anthology is filled with great short stories by amazing Minnesota authors. The book can be purchased at Once Upon a Crime bookstore in Minneapolis or order online at amazon.com (available in Kindle and print version). So far, law enforcement is being stingy with the details they are sharing with the public. They've dribbled bits about tips over the years, but one tip made in the summer of 2017 was apparently the key to breaking the case. Someone attempted to extort the insurance company that had insured the iconic memorabilia. A yearlong investigation by the FBI, including the Art Crime Team, the Laboratory, and field offices in Chicago, Atlanta, and Miami ensued. The ruby red slippers were obtained as a result of an undercover operation in Minneapolis this summer. The FBI, US Attorney from North Dakota, and Grand Rapids Police are asking for the public's help in gathering information on the actual theft that occurred in 2005. The shoes have come home, but the thief or thieves are still on the loose.